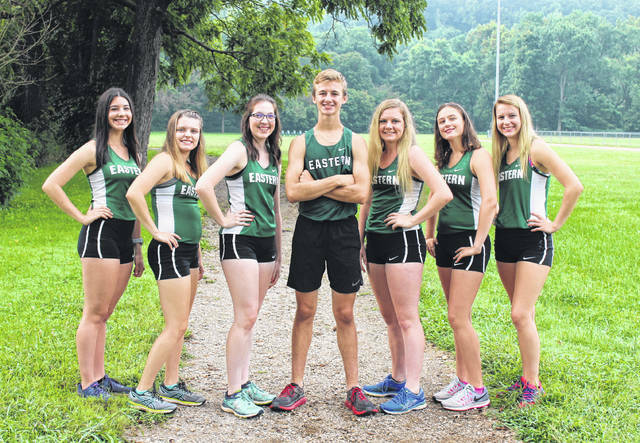 Pictured above are members of the 2018 Eastern cross country team. Standing, from left, are Rhiannon Morris, Ally Durst, Alysa Howard, Colton Reynolds, Whitney Durst, Lexa Hayes and Megan Ross. ALBANY, Ohio — There’s never enough, but eight will do this time around. The Eastern girls cross country team secured the program’s eighth consecutive Hocking Division title on Saturday at the 2018 Tri-Valley Conference Championships hosted by Alexander High School in Athens County. The Lady Eagles posted a perfect score of 15 in the TVC Hocking race, although the outcome was already pre-determined due to the Green and White being the only program with enough entrants for a team tally. The Lady Eagles also came away with a trio of top-seven finishes — including the individual champion — en route to earning three All-TVC Hocking honorees, the most of any program competing in that division. Senior Rhiannon Morris defeated the 26-participant field to win the TVC Hocking girls race with a mark of 20:30.01. Kaylor Offenberger (20:50.49) of Waterford was the overall runner-up. Senior Ally Durst (21:14.66) and sophomore Whitney Durst (21:38.97) also came away with All-TVC Hocking accolades with respective finishes of third and fifth. Lexa Hayes (23:25.06) just missed making all-league after placing eighth overall, while Ashton Guthrie (23:43.23) completed the Lady Eagles’ winning tally by finishing ninth. Alyssa Howard (25:22.33) and Megan Ross (26:31.67) also placed 18th and 22nd for Eastern. Southern had one female athlete earn All-TVC Hocking honors as junior Sydney Roush finished fourth with a time of 21:27.57. Mallory Johnson (23:52.34) and Kathryn Matson (25:40.42) were also 11th and 19th, respectively, for the Purple and Gold. Jessica Luther led South Gallia with a 13th place effort of 24:01.37, while Cara Frazee was also 24th overall with a mark of 26:38.43. Ashlynn Jarvis (22:30.28) of Federal Hocking and Kelly Erb (23:23.21) of Belpre earned the remaining all-league honors with respective finishes of sixth and seventh. The Belpre boys won the TVC Hocking championship with a final score of 27 points, edging Trimble (28) for the title by a single point. Federal Hocking was third in the three-team field with 85 points. Eastern had a single participant in the boys event in Colton Reynolds, and the junior earned all-league honors with a fifth place finish of 17:15.71. Garrett Frazee led South Gallia, but missed the all-league cut, with an eighth place finish of 18:21.06. Griffin Davis was also 29th overall with a mark of 23:37.12. Southern did not have a male participant in the 32-person boys race, which was won by Eli Fullerton of Belpre with a time of 16:24.80. Brayden Weber (17:11.57) and Danuel Persinger (17:13.64) of Trimble were second and third overall, with Jackson Plummer of Belpre placing fourth with a time of 17:13.71. Eric Everett (17:28.78) of Trimble and Evan Wells (18:06.13) of Belpre completed the all-league efforts with respective finishes of sixth and seventh. On the TVC Ohio side of things, the Vinton County girls defeated a four-team field with a final winning tally of 29 points. Athens (32) was the overall runner-up, while Alexander (91) and River Valley (93) completed team standings in the third and fourth spots. Rylee Fee of VCHS defeated the 52-participant field to win the individual TVC Ohio girls title with a mark of 19:19.02. Raney Riddlebarger (19:49.61) of Athens was the runner-up. The Lady Vikings also had All-TVC Ohio honorees in Olivia Mayers (20:12.60), Lilly Chevalier (20:15.65) and Lexi Walker (20:55.64), who respectively placed third, fourth and seventh. The Lady Bulldogs completed the all-league honorees as Cami Hibbard (20:34.14) and Sylvie Wilson (20:45.64) respectively placed fifth and sixth. Lauren Twyman led the locals and the Lady Raiders with a 12th place time of 22:15.50, followed by Hannah Culpepper (23:35.83) and Julia Nutter (25:43.12) with respective finishes of 23rd and 36th. Kaylee Gillman (26:01.74) and Kate Nutter (27:22.10) completed the Silver and Black tally by placing 37th and 41st overall. Connie Stewart (27:25.41) and Lexi Stout (29:07.24) also finished 43rd and 45th for RVHS. Meigs had two female competitors at the event, with Madison Cremeans leading the way with a 26th place time of 23:57.91. Taylor Swartz was also 31st with a mark of 24:56.12. Athens won the TVC Ohio boys championship with a final score of 18 points. Vinton County was the runner-up in the six-team field with 57 points, while River Valley (83), Wellston (117), Meigs (131) and Nelsonville-York (134) rounded out the three through six spots. Tony Tonkovich of Athens won the 58-participant boys race with a time of 16:08.69. Teammates Bozeman Koonce (17:17.51), Walker Evans (17:44.24), Kieran Delach (17:46.08) and Zachary Kessler (17:46.16) also won all-league honors with respective finishes of second, fourth, fifth and sixth. Ethan East (17:31.43) of Vinton County was third overall, while Wellston’s Justin Anderson (17:56.27) completed the All-TVC Ohio team by placing seventh. Dylan Fulks led the locals and the Raiders by finishing ninth with a time of 18:14.05, followed by Cody Wooten (18:34.08) and Rory Twyman (18:40.20) with respective finishes of 14th and 17th. Caleb McKnight (19:54.91) was next for RVHS in 30th place, while Ian Eblin (20:20.65) completed the team tally by finishing 36th. Nathan Young (22:21.53) was also 50th overall for the Silver and Black. Colton Heater paced the Marauders with a 22nd place time of 19:27.54. Christian Jones (20:12.70) and Landon Davis (20:14.95) were next with respective finishes of 34th and 35th. Tucker Smith was next with a 47th place time of 21:52.70, while Brandon Justis (29:14.31) completed the MHS team tally by placing 58th. Visit baumspage.com for complete results of the 2018 TVC Cross Country Championships hosted by Alexander High School.